May 02, 2018 – MEERI KIM, PH.D.
May 17, 2018 – MIKE HENNESSY, SR.
May 16, 2018 – DEBU TRIPATHY, M.D. Second cancers are common among patients with lung cancer, so how can risk be lowered? Michael Levin first noticed the unbearable pain while on a golf trip in Mexico during winter 2007. On the second day of practice rounds, he started to experience an ache from his knees down to his feet. Levin tried to mask it by taking ibuprofen but still felt miserable. A month or two later, back home in Atlanta, Levin went to the doctor after his feet had swollen excessively. He was sent to a rheumatologist, who performed a chest X-ray and a bone scan. The next morning, the physician broke the news to Levin that he had a mass on the upper part of his right lung. He received a diagnosis of stage 2 non-small cell lung cancer (NSCLC), which had spread to nearby lymph nodes. His treatment consisted of surgery and chemotherapy followed by regular surveillance. Every three months, Levin went back in for a chest CT scan along with an MRI of his brain. A few years later, the routine surveillance uncovered four metastatic tumors in his brain. Levin was treated successfully with gamma knife radiosurgery — he underwent this procedure three times — which uses beams of highly focused gamma rays to treat small- to medium-size lesions. 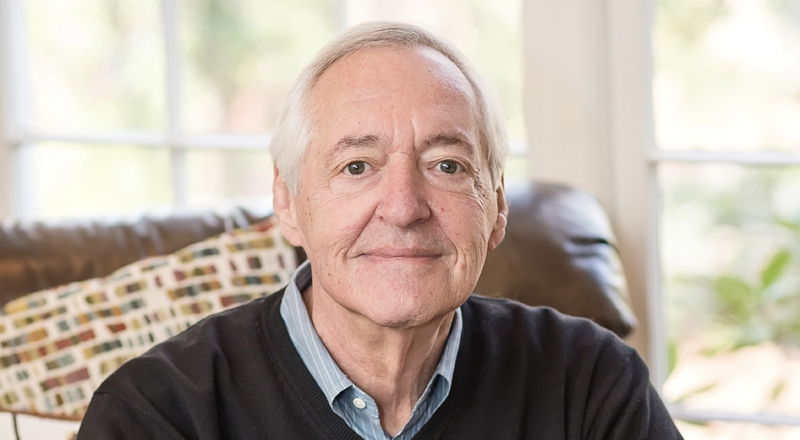 In 2014, a second lung cancer was diagnosed after doctors found a tumor on his left side. A new, unrelated cancer that develops in someone with a previous diagnosis of the disease is known as a second cancer. Although a second cancer can occur anytime during survivorship, some studies show they commonly appear five to nine years after treatment. It differs from a recurrence, which refers to the initial cancer coming back after a period of time when it could no longer be detected. In particular, survivors of lung cancer remain at increased risk for second cancers, such as lung, esophageal, stomach, small intestine, colon, bladder and pancreatic. Once again, the regular scans led to the new tumor being found early, and surgeons successfully removed it. Levin did experience some complications during treatment — he contracted an infection of Clostridium difficile, which is a bacterium that causes inflammation of the colon, in the hospital — but still considers himself extremely fortunate to have survived all that he did. “My survival can be attributed to early diagnosis, and that’s really what gave me the best possible chance for a good outcome,” he says. Nearly 1 in 5 cancers diagnosed today occur in a person who has survived a previous cancer. While improvements in early detection and treatment mean that people are living longer, the possibility of cancer striking again becomes a serious concern. People should consider certain actions like getting regular follow-up exams, which will allow doctors to catch and act on the disease earlier. Lung cancer survivors remain at risk for developing second cancers. The most common in this population is a new lung cancer. Overall, the rate of developing second lung cancers and tumors in the aerodigestive tract — consisting of the combined organs and tissues in the respiratory tract and the upper part of the digestive tract — for these patients is about 10 times greater than that of other adults who smoke. Although the disease can occur in a person who has never smoked, smokers are at greatest risk. Physicians divide lung cancer into two major types based on the appearance of tumor cells when looked at under a microscope. Small cell lung cancer (SCLC) accounts for about 10 to 15 percent of all lung cancers. It develops almost exclusively in heavy smokers and spreads much more quickly than NSCLC. NSCLC is an umbrella term for three disease subtypes — squamous cell carcinoma, adenocarcinoma and large cell carcinoma — and makes up 80 to 85 percent of lung cancers. Bruce Johnson, M.D., chief clinical research officer at Dana-Farber Cancer Institute in Boston and 2017- 2018 American Society of Clinical Oncology President, performed an extensive review of studies looking at survivors of lung cancer and their rates of second cancer. For patients who underwent surgical resection for NSCLC, the risk of a second lung cancer is approximately 1 to 2 percent per year and appears to increase over time. Those treated with chemotherapy and chest radiation for locally advanced lung cancer have a higher risk of a second lung cancer than those treated with a surgical resection alone. Johnson favors following patients at risk for a second lung cancer with chest CT scans. The patients followed with clinical examinations and chest radiographs rather than chest CT scans had a two-year survival of only 25 percent, so more intensive follow-up is warranted. Data are much more limited for patients who had SCLC because only 7 percent of them survived for two years or longer. According to Johnson’s analysis, the risk of a second lung cancer for SCLC survivors rises from about 2 percent per year to rates approaching 10 percent per year after the passage of a decade. The second lung cancers are typically NSCLC — namely, adenocarcinomas and squamous cell carcinomas — arising in a different anatomic site from the initial tumor. Tobacco products not only are a risk factor for developing cancer but also can exacerbate illnesses like heart disease and chronic obstructive pulmonary disease, more commonly known as COPD. In a study published in the Journal of the National Cancer Institute, of 611 SCLC survivors examined, no second lung cancers occurred in the small number of patients who were nonsmokers. Relative risk remained stable over time for patients who had stopped smoking before receiving a diagnosis of SCLC, but those who quit at the time of diagnosis had increasing likelihood of a second lung cancer over time. “For our patients who have had a lung cancer, the most important thing that we tell them is to stop tobacco use or smoking because that’s usually the most common risk factor for developing lung cancer,” says Rathi Pillai, M.D., an assistant professor in the Department of Hematology and Medical Oncology at Emory University School of Medicine in Atlanta. The same study also investigated the contribution of initial treatment type to the development of second cancer. For instance, radiation is known to cause damage to healthy cells and possibly contribute to a second cancer. Patients who received chest irradiation had a thirteenfold greater risk compared with the general population, while those who got other types of treatment had a sevenfold greater risk. Overall, the type of chemotherapy used to treat the latter group was not associated with a significant difference in risk. Generally, the risk of getting a second cancer after radiation therapy goes up as the dose increases. The area treated and the age of the patient when they were treated also affect cancer risk. Solid tumors take time to develop, and many are not seen for at least 10 years after initial treatment. Lastly, smoking increases the risk of a second cancer after radiation. Survivors can lower the risk of developing second cancers by eliminating tobacco, maintaining a healthy weight, staying physically active, following a healthy diet and limiting alcohol consumption. They can also find out more about their family history and receive genetic testing to see if any predispositions or conditions exist that would further increase their cancer risk. She suggests getting CT scans at least once a year to monitor for recurrence and the development of a second tumor. Also, survivors should make sure to keep up with other routine tests like mammograms and colonoscopies. Unfortunately, Levin recently received a diagnosis with what is likely to be his third lung cancer but could also be a recurrence, as well as prostate cancer. Despite the many setbacks, he isn’t ready to give up. Levin, who has been married for 51 years and is a father and grandfather, considers himself blessed to have his loved ones for support. He has also become heavily involved with patient advocacy and outreach with the Lung Cancer Alliance since his initial diagnosis.